Hey Fred, how are all your approvals tracking today? Once a multi-tiered approvals workflow is established, how do different personas use a single view to track the varying sets of approval details that are relevant to them? 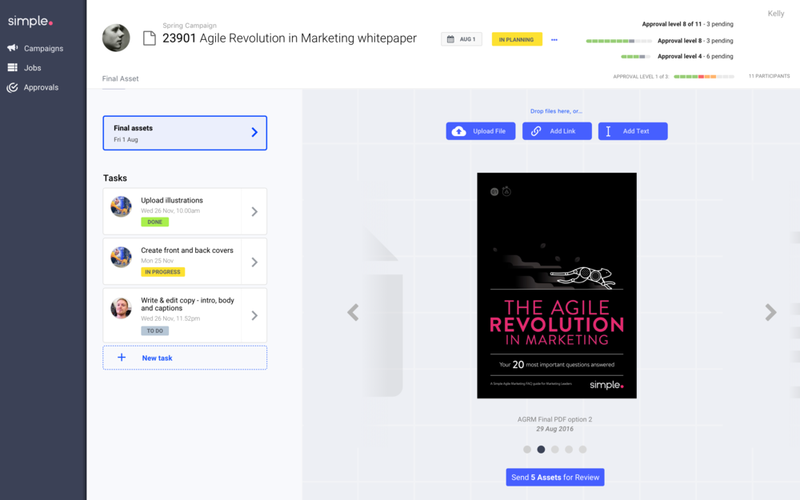 The marketing approval process is generally a high volume, deadline-driven, fragmented, and inefficient process dominated by multiple media formats, complex hierarchies and a lack of transparency. 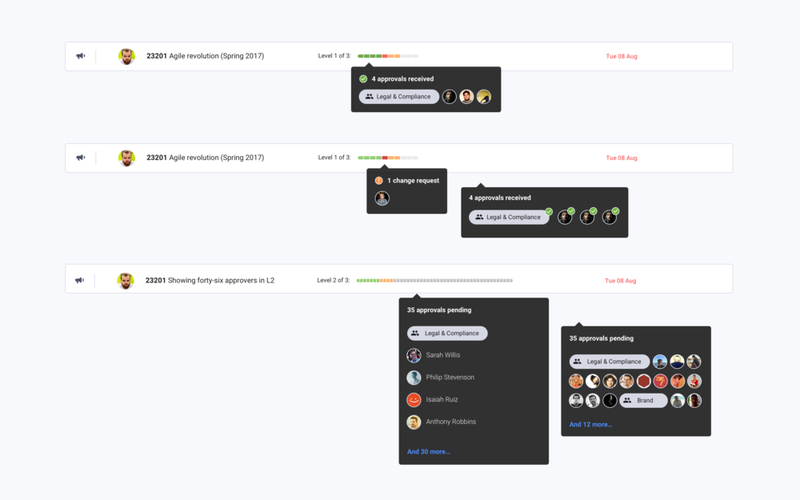 After solutioning an effective structured approval workflow, the next step was to provide a quick way for all participants to keep track of all relevant approvals in play, so they can follow up / action them / manage team workloads accordingly. Interviews were conducted with product managers and customer consultants familiar with user interactions and gaps in the previous platform, the outcomes of which were validated with a panel of end users. As a Senior Creative, I need to know what work produced by juniors I need to approve now, and what's upcoming, so I can action them quickly and avoid missing our deadlines. As Senior Legal & Compliance Officer, I need to keep track of what my team need to approve now or in the near future, so I can manage their workload and ensure work is delivered on time. As a Campaign Manager, I want to know what jobs are being held up by which approvers so I can follow up and ensure my campaign is delivered on time. As CMO, I need to know what campaigns are being held up by what approvers so I can follow up with managers to get work to market faster. Lack of transparency is the single biggest challenge for Marketers once approval has been requested for a campaign, job, or asset. Understanding who is currently responsible in the review process is critical to drive approvals forward and meet fixed deadlines for content delivery. 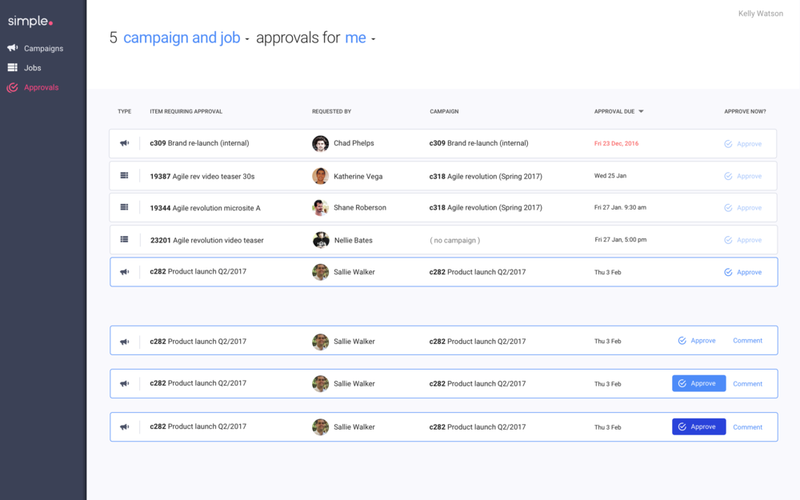 Various approval solutions exist from lightweight (Google Docs, Asana, Trello) through to more advanced flows that are also very complex and "heavy" to use (Workfront, Wrike etc). Our goal was to deliver a flexible but intuitive experience that surfaced exactly the information each persona required, without any additional configuration by each user. Multiple iterations and test sessions resulted in a number of variants of UI elements and interaction sequences, however this work was parked in preference for other higher priority deliverables in the lead-up to MSP product release.